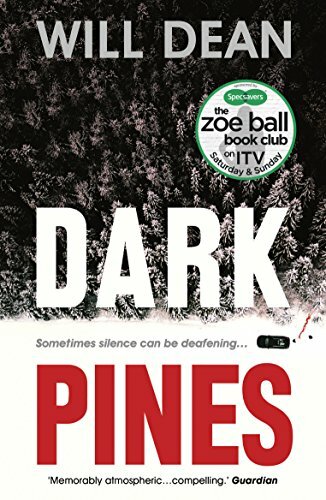 Dark Pines is Will Dean’s debut novel from Oneworld Publications, which was recently featured on the ITV series The Zoe Ball TV Book Club. Dark Pines by Will Dean introduces us to Tuva, a young deaf reporter who has moved to a small rural town in Sweden to be closer to her terminally ill mother. Her days are filled with local council based news until a body is discovered in the nearby woods. For Tuva, it’s the most action she’s seen since she arrived but for the locals who’ve been there longer, they’re reminded of a spate of murders in the woods twenty years early. Murders that were never solved. The press called the deaths the Medusa Murders due to each of the victims having their eyes removed and when it’s discovered the latest body is missing the eyes, everyone knows that either the murderer is back or there’s a copycat on the loose. Tuva sees her chance to report on a real story, something that’ll help her get noticed when she returns to work in the city and she starts to investigate. She starts with the people closest to the murder scene, interviewing the owners of a handful of homes on the edge of the woods. Early suspects include a reclusive author, a creepy taxi driver and a pair of sisters, twins that create handmade trolls with human hair and nails. She’s unnerved by all of them but is any of them really capable of murder? Scandi crime is well known for its strong female leads and Tuva is no exception, she does, however, have a handful of unique qualities that make her stand out from the rest. First up, she is not at home with the nature around her, it positively terrifies her. Because of this, the woods themselves come across as a threat in their own right. From bugs to elks, she’s nervous about it all and has to make a conscious effort to brave the woods on her own. Secondly, she’s deaf and relies on hearing aids and lip reading to communicate with the people around her. The way this is handled is really refreshing; Truva refers to the positiveness of her deafness rather than referring to it as a problem. She talks about the peace of being able to detach so fully from the world around her, it’s mainly the people she interviews that are fascinated by her lipreading rather then it being something she thinks about. Thirdly, she’s currently in a relationship with a local lady but also refers to dating a man in London. The book doesn’t focus on this or define it in any way but together it all helps you to create a far more rounded character in your head as you read. The scene setting in this novel is incredible, you can virtually smell the crispness in the air and the pine needles beneath your feet. As I mentioned earlier, after Tuva it’s really the woods that is the secondary character. it’s as alive as any of the suspects. The epic finale of this novel involves some trekking through the woods and the descriptions are so spot on they left my skin crawling. As for the ending, it outwitted me and I didn’t guess it; but when I looked back there are so many tiny clues that I felt like an idiot for not know. But that’s a great crime book for you! Dark Pines is a brilliant debut and as this is the beginning of a series it’s great to know there’s more to come from Will Dean. The follow-up novel, Red Snow is out in December and after devouring Dark Pines, it’s going to be at the top of my Christmas wishlist. If you enjoyed this review you may also like my review of I’m Travelling Alone by Samuel Bjork.